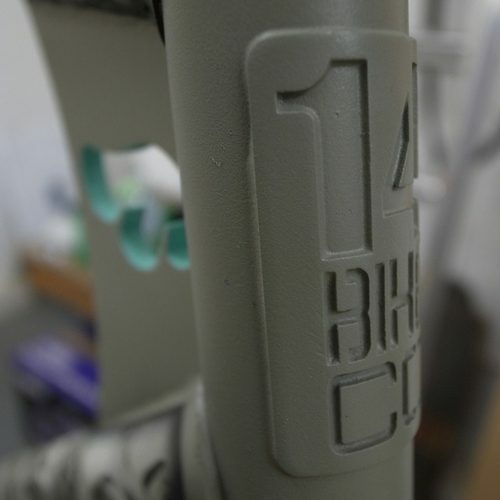 Here’s a little sneak peek of a project bike for this weekend’s Bright Trade Show by 14 Bike Co. The London-based shop collaborated with local artist D*face on the bike and this is all we’re getting to see for now. It’s the 10th Bright trade show this weekend and each show has had it’s own specific colorway over the years. As the guys behind Bright are fanatic about bikes and especially fixed gear, we thought it would be amazing to use the 10 colorways, as a guide for each artist (from 10 different cities) to create a unique one off frame. Each frame and fork has been hand made by 14 Bike Co in Coventry. Most of the finished frames will be on show at Bright this weekend, along with artist renderings for the remaining frames. All frames will be auctioned off for a charity that Bright has been working with.